It's never too late to celebrate Mother's Day. In fact, the whole month of May should be Mother's Month. 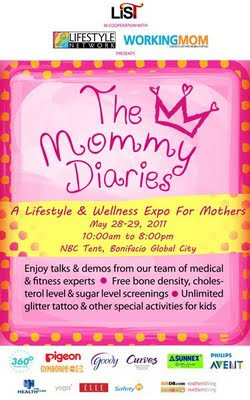 In line with this, "The Mommy Diaries, A Lifestyle and Wellness Expo for Moms" will be held on May 28 and 29, 2011 at the NBC Tent, Bonifacio Global City. This 2-day lifestyle and wellness expo will feature more than 150 booths that offer various products that moms of all ages will definitely love. Activities will also be held such as cooking shows and demos, talks by pediatricians and psychologists, special treats and entertainment for the kids, and raffle draw every hour. "The Mommy Diaries, A Lifestyle and Wellness Expo for Moms" is brought to us by LiST Group in cooperation with the Lifestyle Network and Working Mom.